In Nov 2009 Comeragh Controls was employed as a subcontractor by Dalkia Limited to design and provide a zoned heating controls system in a full-time residential care facility in Stewarts Hospital, Palmerstown, Dublin. Comeragh Controls has impressed Dalkia and the client in their attention to detail and level of professionalism throughout the installation and commissioning period. 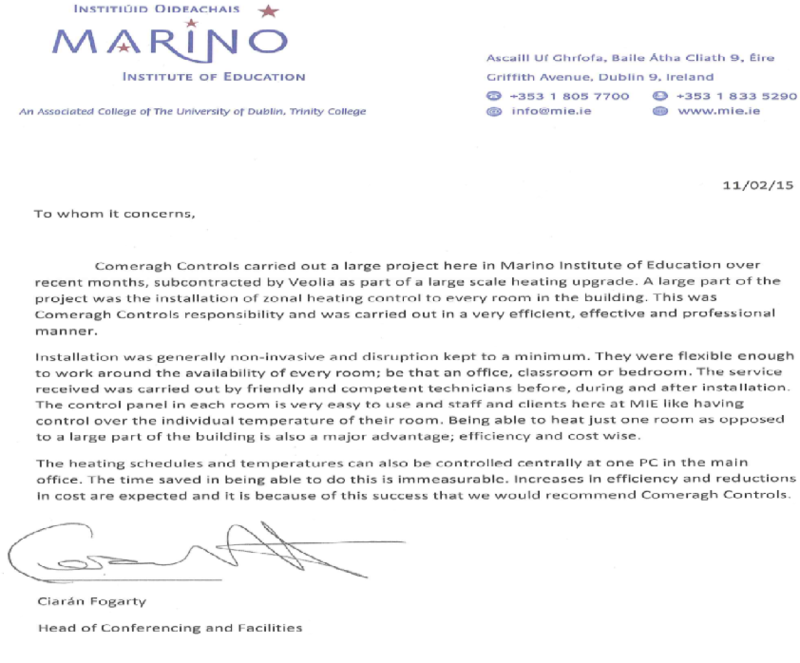 We were particularly pleased with how Comeragh Controls always ensured that there was minimal disruption to the building’s heating system throughout the installation. To date the feedback from the staff working in the building and the hospital’s Technical Services Department has been very positive by all involved as the new system brings a greater degree of control and comfort to the staff and residents in the building. Significant energy savings are expected from the project mainly due to the zoning aspect of the project which means rooms are not unnecessarily heated as certain times each day. Dalkia would highly recommend both Comeragh Controls and their Zone Control system, the Rad Master, to any facility endeavouring to reduce its running costs and increase the comfort levels for its occupants.